JIAXING COB-SRIM bearing Co.,LTD. is COB bearing INC. &Shanghai Research Institute of Material in Jiaxing formation of the joint investment research,design & development, production as a whole,the bridge support and Thrust bearing pads(PTFE) / Elastic metal-plastic(EMP) thrust bearing pads, self-lubricating bearing and Solid-Lubrication Bearings professional Enterprise.The company occupies 41,000 square meters, construction area of 32,000 square meters; fixed assets have more than 3,000 million; more than 600 employees, of whom more than 150 engineers and technicians, a professional titles more than 70 staff; in the production of various types of bearings of a total of more than 4500 million units one year. 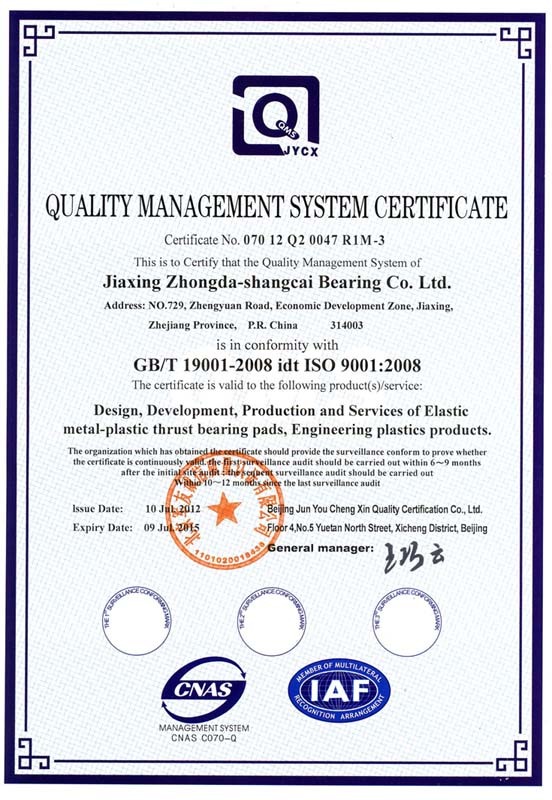 COB-SRIM product: Thrust bearing pads(PTFE)/Elastic metal-plastic(EMP)thrust bearing pads, PTFE plate, UHMWPE plate, self-lubricating bearings, and Solid-Lubrication Bearings and so on several varieties. At present,the main provider of domestic and foreign largescale hydropower station group thrust bearing pads, bearing guide;coal thermal power generating units of thrust bearing pads; South-North Water Diversion Project of the largescale pumping radial bearings, a large cement mill Thrust bearing pads. COB-SRIM provider VOITH SIEMENS, ALSTOM, United Kingdom of David Brown,India of Bharat Heavy Electricals, Germany of Flander reducer providing them with necessary thrust bearing pads; the world-famous Magnetic Levitation Train, the East Sea Bridge, Hangzhou Gulf Bridge of PTFE plate. COB-SRIM always pay attention to product quality and aftersales service, Now COB-SRIM through QS9000 & ISO9001 international quality system certification. COB-SRIM products Main sold United Kingdom,Germany,France, Italy, Sweden, the United States,South Korea, more than 30 countries; the main customer for VOITH SIEMENS Shanhai, ALSTOM Tianjin, United Kingdom of David Brown, Germany of Flanders, India of Bharat Heavy Electricals, Shanghai Automotive Industry Corporation, China car Industry, Guangzhou Automotive Industry, China Automobile Industry, Shanghai heavy machinery Co.,Ltd., Nanjing High-precision gears Co.,Ltd. ect. 100 major Chinese and foreign enterprises. COB-SRIM 070 Self-lubricating Skateboard, COB-SRIM 120 Ball Retainer. Address: Zhengyuan Road,Jiaxing Economic Development Zone, Zhejiang, China. Company: Ningbo Huijie international trade Co.,Ltd. NO.224 Yangming west road, Yuyao, Zhejiang, China.